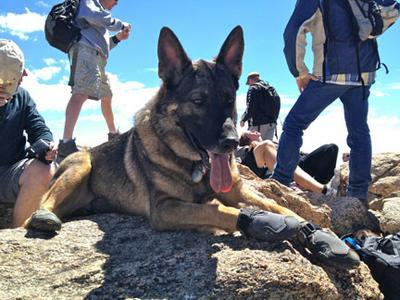 Kona, our female 85 lb 3 year old Sable, working line GSD just climbed her first 14er this month. Here is a picture of her at the summit of Mt. Bierstadt in Colorado. What a great picture that is of your female German Shepherd, Kona, atop that mountain. Fantastic! She looks like she belongs there. It's true that German Shepherds are wonderful athletes and having made it to the top of that mountain with the rest of your team, Kona has proved that she is a wonderful climber too! I wonder what she was thinking once she got to the top with the rest of you? I admire you for taking her along and judging from the booties and everything it looks that you took extra good care of her all along the way. Good for you - and her too! So, now that she is a full fledged mountaineer, whats next in line for you and Kona? What cool adventure do you plan on under taking next? Hmmmmm..... No matter what you choose, we'd love to see the photos! Continued success with your great German Shepherd - she is a beautiful girl. And a great ambassador for the German Shepherd Dog breed too. Way to go Kona! You're our favorite canine mountain climber! What a Pretty Girl!!! You take good care of Kona right down to the her booties. Looks like she Loves the climb and the adventure. Take care of your girl and she will take care of you!!! by: Lt. Ronald McCarty Ret. Beautiful PUPPY. I'd like to see more pictures of Kona. We all will be waiting.